Everyone dreams of visiting Paris at least once, don’t they? And when it comes to Paris, the Louvre is definitely at the top of people’s must-visit list. With all that is there to discover within the museum’s walls, it certainly is no surprise at all. Nintendo seems to get the appeal of the Louvre, and the company has decided to jump on this by creating an audio guide for the 3DS. 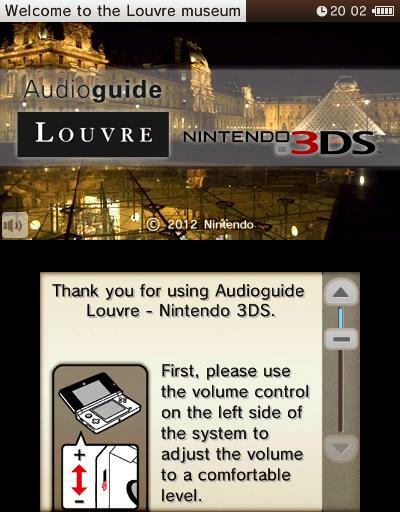 Starting yesterday, April 11, the Louvre will be offering 3DS systems with the audio guide built-in. 3DS audio guide for the Louvre, together with the devices, is provided by Nintendo under the terms of its partnership with the renowned museum. While I am not sure that everyone who wants to visit the Louvre and spend a lot of time there will be particularly enticed by the 3DS audio guide, the idea is not a bad one. It will make things more convenient, and if the technology is available, why not take advantage of it? However, if I were to go and tour the Louvre, I would prefer a person (with a delightful French accent) to guide me around. Call me an old traditional person, but that’s what I would want! To be fair, the developers seem to have worked really hard on the 3DS audio guide. The guide has more than 700 commentaries on the pieces you can see in the museum. The commentaries are recorded by curators and lecturers from the museum, so that is a positive thing. It is also supposed to offer visitors a new perspective regarding the museum and its collection. Find out more about the 3DS audio guide for the Louvre at Games Catalyst.